One of them is a tragic story: My friend’s beautiful daughter, a real angel, was suffering from a physical issue that was more painful for her and for the family than her autism. The grandfather, who loved her very much and spent a lot of time with her, wanted to stop the suffering and took her life and then his own, when she was only 7.
http://www.autismspeaks.org was founded by grandparents to a child with autism, and per their site they became the leading autism science and advocacy organization, dedicated to funding research into the causes, prevention, treatments and a cure for autism and increasing awareness of autism spectrum disorders. Admirable! 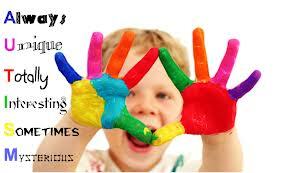 I would like to invite more parents of autistic children to join http://www.parents-space.com community of writers. People, this is exactly what I created this site for! To share, spread awareness and help others with their struggles and daily challenges. To the many of you who are intimidated by my request to post twice weekly: I know it’s a lot, and if you are taking care of a child with disabilities you have no time to post twice weekly. Reblogged this on The Naked Cavewoman. I’ve come to help with Autism Awareness Day here in Libya, the first ever of which my mother (community paediatrician with a focus on autism & ADHD/ADD) is organising. Can wait to upload photos. It’ll be great if it’s received positively. My oldest is Autistic and it sad to see so many people who have no idea really how awesome someone with Autism can be. I do know he definitely shows them his world where ever we go. This is a nice post about it and here’s to raising more awareness. My Nephew has Autism, and had so many food issues/texture issues, which are slowly improving as he gets older and after getting help at schools that his parents placed him in. What’s amazing about my nephew is that he has found a love in martial arts-Tae-Kwon-Do. He’s a blackbelt and this was a sport that he could shine in. Autism speaks is a wonderful organization doing great work. They currently have a petition going to ensure federal funding for all the children with autism now and the future children who will be born with Autism. I had the pleasure of working with a young woman who has autism last summer at a day camp. Her and I got along very well and she was a lot of fun! My son is being diagnosed in a month. He is the sweetest most loving person I know. Everyone who meets him is taught something new. He is a blessing and I am the lucky one who gets to be his momma. Thank you for mentioning autism awareness day, it goes without saying that is a special day for us. As a special education teacher, I have been lucky enough to work with quite a few teens with Autism. I have learned from each and every one of them. As an Educator and Parent Life Coach I truly believe that awareness is the key. I shall do my part by re blogging this post. We will be displaying our blue autism awareness light proudly! For anyone who may not catch it on the original blog, here it is again! Are there any blogs on adults with mild aspergers where their main struggles are with relationships? I don’t know, and if there is I hope that one of the readers will answer you. Would you like to write in parents-space.com about that? Thank you. I will check into parents-space.com I have never been there. Autism awareness is obviously a great thing, provided it can be combined with a level of understanding and acceptance (something that unfortunately is often lost in the excitement of such a large group like Autism Speaks.) I have three autistic children and they are simply the most beautiful children you will ever meet (I admit I’m a bit biased. 😉 ). They love light it up blue day – they look at it as a celebration of something that makes them special. I’d love to help you out, though I know I could never commit to that two times a week thing. 😉 Thanks for stopping by my “place” and feel free to contact me if you still need folks. This is a great idea you have here. Looking forward to reading more. While founding that organization may be preferable to murder it has as it’s number one research priority the development of a prenatal test to screen for autism. Also if you look closely at their financial breakdowns (publically viewable and accessible) almost none of the money raised by them goes into actual services for those on the spectrum.Up until two years ago none did. The majority goes into more fundraising and the salaries who do it. It also promotes the very same tragedy model of autism that leads people to conclude murder is preferable. That’s consistent with nearly all successful fundraising but people should question that. Autism is no picnic, however real awareness starts with acceptance and you don’t hear much acceptance from this group. In fact they made the news a few months ago for not going through with the hiring of a mother of an autistic child when she requested to leave early to accomdate his schedule. Even when she changed her arrangements and arranged alternative care so she could work the usual hours she was not hired. They have on more than one occasion sued actual people with autism for parody sites. I’m Canadian and even I know that parody is protected speech but that’s part of what you are supporting when you go with light it up blue. As an alternative you might try: https://www.facebook.com/pages/Tone-it-Down-Taupe/446945788708219?ref=ts&fref=ts This year autstic community has gone in a bit more prepared. If you love someone with autism do consider that even if it is not obvious they may be capable of understanding some of what is said about their condition (this group had many representives testifying in December before a subcommitte in the US and using words like plague and burden while waving around their autistic children as props. I’ve been that silent child who could understand how the world viewed me. Experts were prepared to write me off before I was 6 as “asocial, lacking in play skills and probably retaded ” . Imagine even one in ten of those kids could understand what their parents or grandparents was saying. (No doubt more could) Do you know what it feels like to try to live in a world you are not well suited to and to do that under the crushing weight of a very public preference for the elimination of people like you? Please reaserch the whole light it up blue thing and the people behind it and make an informed choice. Reblogged this on My Turf Beyond. It is very good to have come across your blogs on ASD. Although I do not personally have a autistic child, please don’t discount me when I say that I have a heart and passion to help in anyway I can by form of advice or via discussion, to learn from one another. My tertiary background is in child and adolescent psychology, and have personally worked with a very lovable autistic little girl. I understand how tremendously exhausting and stressful it can be for parents or caregivers without the right support. So kudos to you all for setting up this blog space!